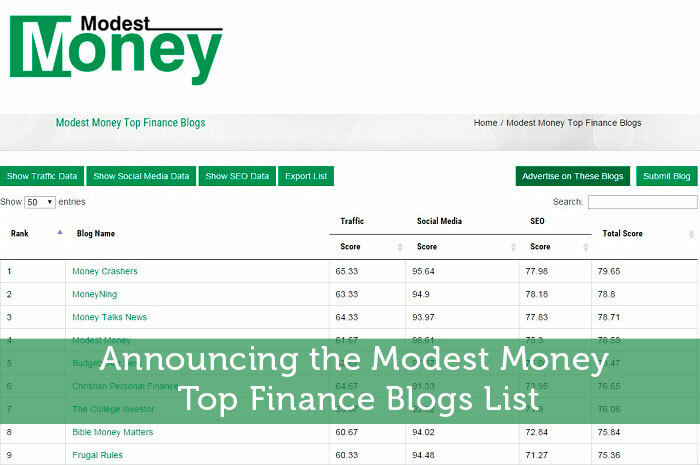 This post is to announce the launch of the Modest Money Top Finance Blogs List. I decided to start this list as I wasn’t satisfied with the other top finance blogs out there. One of them rarely updates. The other popular list has a tendency to sometimes break when it updates stats. Plus they don’t consistently update all stats. What gives? I decided there needs to be a more reliable list to rank the best finance blogs. Not only will this list be a lot more stable but it will include a lot more stats. This should make it more valuable to both bloggers, marketers and advertisers. People who read finance blogs could use the list to help find other blogs to read too. As I started my IT career as a web programmer, I had a pretty good idea about how to improve upon the existing lists. Ok so I didn’t actually program this myself as my programming skills are far too rusty. All of my outsourcing experience definitely helped out. So if you have a finance blog, I suggest you submit your blog to the list to gain some extra exposure. Everyone else, I suggest you check out the list to discover some other blogs to visit. It would be awesome if you could share this list socially to help get the word out. What do you think so far? Is there anything that you suggest I change? I do have plenty of changes in the works, but I’d be curious to know what you think. Check out the Top Finance Blogs List here. I’ve heard the same thing about the WB from a number of other bloggers. I haven’t decided on all the features I’ll be adding to this list, but I agree it’s a solid start so far. What about a qualitative measurement alongside the numbers? lol…let me know when you find an automated tool that can measure that. Perhaps I could eventually work some kind of poll feature into the list, but that would be tricky. Nice work Jeremy! I think you are off to a great start and now we can have something that has updated stats. Thanks Grayson. Hopefully other people find it to be a solid resource too. Took me a while to find the link. Maybe add a another one that is more obvious at the bottom. I love this! But when trying to sort asc/desc in the Majestic SEO category, it doesn’t seem to be sorting correctly. The other columns look find so maybe it’s something with the way the data is pulled from Majestic SEO. Is there a way to make the data selectable? It’d be nice to copy/paste some of this. My only other little quip is that the “show” settings don’t save when you go to the next page. It resets to only show scores in all the columns. Thanks for the feedback Leslie. I’ll have to check with my programmer to see if he can help fix those issues. I can see why the Majestic SEO category isn’t sorting right, but I can’t fix that myself. I am excited to be on the list, but now find myself obsessed with getting my SEO numbers higher. Although, I have to confess that until recently I had no idea what SEO meant. Oh well, I always love challenging myself and pushing myself to get better and this is a great motivator. Smiled when I read this and had to reply. Until recently I didn’t know what SEO meant either! That’s actually pretty common with bloggers it seems. Many jump in just focusing on their writing only to later learn the marketing side of things. Good luck pushing those stats higher. Very cool. I posted to my blog about it, so hopefully that’ll help spread the word. Thanks for the help getting the word out. Great list! Some of my favorite blogs are on there. Good to hear except for the ‘some part 🙂 Hopefully the others get submitting their blogs soon too. This is incredible! Glad to see my site on the list. Thanks for helping coalesce us to a top list that’s more recent/updated. No problem Sam. Now with any luck it isn’t too much work to keep the list going and continuing to improve it. No problem Glen. Thanks for taking the time to submit your blog. Great idea, it will bring you many new readers and solve the past list issues. We’ll see how many readers it actually brings me since it will lead people to other blogs instead. I think I’ll still find ways to benefit though. Seems like you’re focusing on real blog-blogs, so more power to ya! lol J$ you would like it so far. I’ll have to find some other high ranked bloggers to compete with you. As for including company owned blogs, no need to paint me into a corner 🙂 There are some company owned blogs in the list and I will likely include others. They’ll just be under a lot more scrutiny. I don’t think I should include some of those great resources just because they’re company owned. Many personal blogs end up just as commercial. Looks good to me, I’ve just gone ahead and added my blog. My only issue with these types of lists is that they are so easy to manipulate. It’s true that almost any of these individual metrics is easy enough to manipulate, but for the most part they paint a decent picture of the actual standings of the blogs. Most bloggers actually wouldn’t know how to significantly manipulate these metrics. Great ranking! I have visited some of those sites and read their blogs, they’re posts are very worth time to read. good job! Thanks Marie. I hope the list helps others find all these great blogs too. Glad to be included on the list; lots of quality PF bloggers out there. Yes there certainly are. Now I just need to convince the rest of them to submit their blogs too. Wow! Something massive for me to aim for! My million dollar blog is still very new, but it’s worthwhile aiming high. I’d love to be able to make this list. Aiming high on the list is pretty optimistic since it takes a lot of time to build up these kinds of stats. At least you can set goals to get to a certain position each month or whatever though. Yes this list is bound to expose people to a lot of other bloggers. Good luck with all the reading. Glad you started this one Jeremy. You are right all the previous ones were garbage and never updated. It’ll be interesting to see if they notice my list and get motivated to improve their own lists now. One of the main benefits of this type of list – aside from seeing your own rankings – is to find other like-minded pf bloggers that you can start networking with and building relationships with. If you want to be successful, it’s all about making connections! Very true Jon. Bloggers really should keep stats in mind when networking if they want to really grow their blogs. If they only focus on newer bloggers, they’re going to grow their own blog a lot slower. Thanks so much for the list and for letting us submit our own site. I still have a long way to go but this will motivate me even more! Amazing list that mentions the top finance blogs. Very useful for someone looking for the best finance blog. the list posted elsewhere were not really helpful but this one is! Great Work! I have found it to be very effective If however you are offering financial advice, I still have a long way to go but this will motivate me even more!